Ancestry dot-com has 2 million subscribers worldwide. Sounds like a lot. But if their subscription base were U.S. only, it would be only 6/10ths of 1 percent of the population. Since their subscription base is worldwide, the paid subscription service represents only 4/10,000ths of 1 percent of worldwide population. These are market share numbers that are essentially non-existent. By contrast, 16.6% of the world’s population owns an iPhone. Okay, “nothing” is a little harsh. There are a lot of individual efforts to attract new woodworkers… clubs, magazines, on-line publications, classes, retail establishments, manufacturers, and yes, the laudable Get Woodworking Week. But these are scattered, uncoordinated, and under-funded efforts. Sorry, still sounds harsh, doesn’t it? But it’s true. Now consider this… while the size of the industry is hard to nail down precisely, one report lists the U.S. sales of woodworking equipment at $712 million. Keep in mind, even if this number is close to correct, it is only “equipment.” It is highly likely that hand tools, portable power tools, supplies, and wood are not included in this number. But for now, let’s play small ball and pretend the U.S. woodworking market represents $712mm in annual revenue… I actually think the market is 8 times that big… or bigger. Now let’s pretend that a “woodworking marketing consortium” could be organized and its sole objective… its mission statement… is to reach potential “new” woodworkers. If each manufacturer, reseller, and supplier paid in 3/10ths of 1% of sales (that’s 3/10ths of a penny for each dollar of sales), the budget of the consortium would be $2,136,000. $2+million dollars would buy a lot of marketing directed at new potential woodworkers. So let’s try to come at the number from a little different direction. If the recent survey conducted is correct, and 5.5 million people are hobbyist woodworkers, and each woodworker spends on average $1,000 a year on woodworking supplies, tools, wood, and equipment, that is a whopping $5.5 billion in annual sales. At 3/10ths of 1 percent, the “Consortium” would raise $16.5 million for marketing. How many woodworkers could we lure into the hobby with that kind of money to spend? About this time you might be wondering how I picked “3/10ths of 1 percent” as a fair hypothetical contribution for manufacturers and sellers? Well, on average, companies spend from 3 to 5% on their own marketing. I simply took the low end of that scale and imagined “selling” the concept to a company as “Consider contributing 1% of your annual marketing budget.” Thus if a company has $10mm in annual sales, and a $300,000 budget for marketing, their contribution to this effort would be $3,000. Seems like a small “ask” for such a potentially large reward. Now we can do a little exercise in “sales projection.” A direct marketing campaign that generates a 3% response rate is considered “successful.” An outstanding campaign might generate up to a 5% response rate. A campaign is not usually considered to be a “failure” unless it generates less than 1/2 of 1 percent response rate. For the sake of conservatism, we will project a 1/2 of 1 percent “hit” rate for our new “Bring In New Woodworkers” marketing campaign. Our budget for the marketing campaign is $2mm. We are going to use the smallest numbers throughout our hypothetical. We spend about $200,000 doing a deep data analysis and development of a list of potential “targets” for our campaign. That leaves $1.8mm for the campaign itself. Our advertising, in whatever form it might take, costs $10 per impression, a high number, but remember, we are being conservative. That means we can reach 180,000 potential new woodworkers. And now if we assume the worse and project that just 1/2 of 1 percent of those reached get interested and become woodworkers, we will have brought 900 new woodworkers into the hobby. If those 900 new woodworkers each spend $1,000 during their first year of participating in the hobby, we will generate almost one million dollars of new revenue for the manufacturers and resellers that ponied up the $2mm in “joint” marketing fees. That doesn’t sound like a great return on investment (ROI), but remember, we are talking about woodworkers who might spend $1,000 per year on tools and supplies for the rest of their lives! That means that in about two years, there is a 100% ROI. In my life I have found that the only thing that makes something impossible is a lack of imagination. 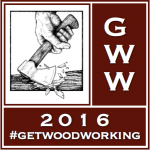 “Get Woodworking Week” is a great concept. Perhaps there is a way to take it up a notch.